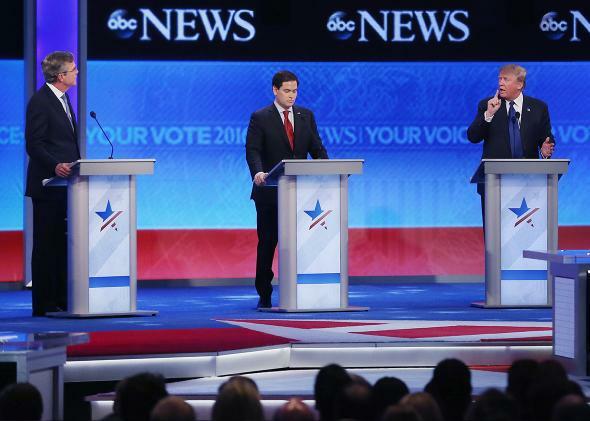 Donald Trump booed by debate audience as Jeb Bush scores point. Jeb Bush, Marco Rubio, and Donald Trump at St. Anselm College on Feb. 6, 2016, in Manchester, New Hampshire. The feud between Donald Trump and Jeb Bush has been one of the most prominent storylines of the 2016 presidential election, and Bush has rarely gotten the better of Trump during their exchanges at Republican debates—until Saturday night, when Bush’s attack on the real estate developer about an attempted Atlantic City eminent domain seizure left Trump being booed heavily by the audience at St. Anselm College in New Hampshire. Trump: A lot of time—let me talk. Trump: … that’s all of his donors and special interests out there. CLARIFICATION: 75 PEOPLE are donors. Not percentage. 1000 in audience. Here’s more on conservative concerns about Trump’s use of eminent domain.